Here's my card for the current Fusion challenge. 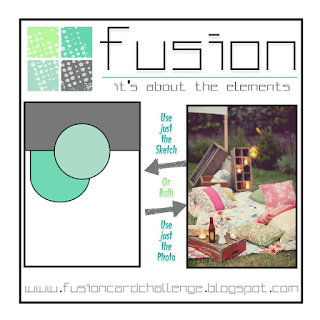 I combined the sketch with elements from the inspiration photo--the floral prints on the pillows, the woodgrain from the crates, and the colors from the textiles--to come up with this thank you design using stamps from Avery Elle. I stamped the large flower and a leafy branch from the Petals & Stems set on white cardstock in pigment inks, then carefully cut out the stamped images. I assembled a background for them by topping a woodgrain patterned paper panel with a wide strip of bright pink cardstock that would contrast nicely with the pale pink flower image. The pink strip was edged with some cream trim in a nod to the textures of the textiles in the photo. I stamped the "thanks so very much" sentiment from the Sentimental set in pigment ink on a pale green rounded banner panel and positioned to extend out from underneath the bottom edge of the bright pink panel. The flower was added to the panel using foam tape for dimension. I trimmed down the leafy branch a bit and tucked it beneath the raised flower. 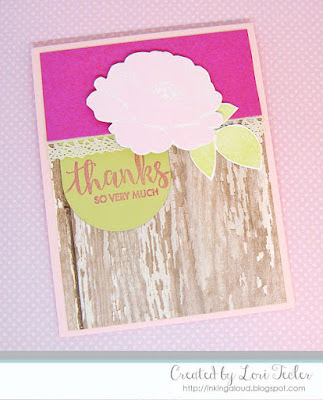 The finished panel was adhered to a pale pink card base to match the flower.